To provide to individuals from any background: the wisdom of Vedanta and the practical means for spiritual growth and happiness, enabling them to become positive contributors to society. August 7th 2002 Wed. 7:00-8:30pm Relax in Vedanta Bothell Libary 18215 98th Ave NE Bothell. 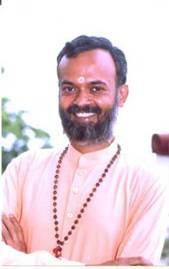 Swami Chidatmananda is Acharya of Chinmaya Mission, Hyderabad and Regional Coordinator of Andhra Pradesh. 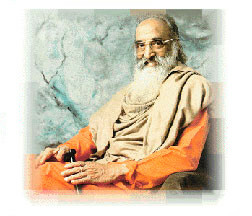 Inspired by Swami Chinmayananda, he became a Swamiji at a very young age and is serving the society for the past 10 years. He is a law graduate from Osmania University and the only son to his parents. He is famous for his Gemini and Doordarshan ( India's widely viewed channels on television) talks on topics such as the Bhagavad Gita & Vemana padyamulu. He also speaks on Vedanta, Upanishads, Bhagavad Gita, Ramayana & Mahabharatha. Apart from these, he has conducted many sessions for various government organizations, management schools, IAS and IPS trainees, and politicians on stress management, mind management, self-management, ethics & morals. His ability to explain the most complex concepts of the Upanishads in simple and fluent language is well acclaimed.